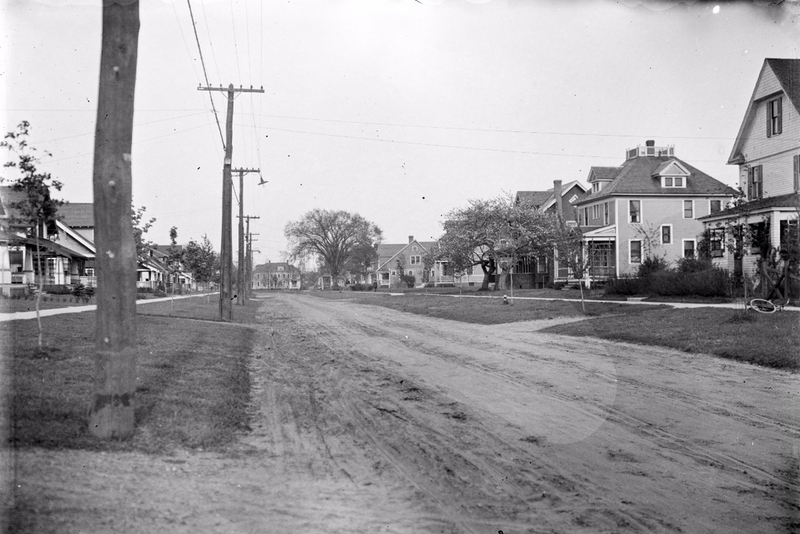 Looking east on Converse Street from the corner of Longmeadow Street, on May 13, 1913. Image courtesy of the Longmeadow Historical Society, Emerson Collection. The two photos on the left are the same ones seen in the previous post, and this view shows some of the development along the western end of Converse Street that was happening in the 1910s. 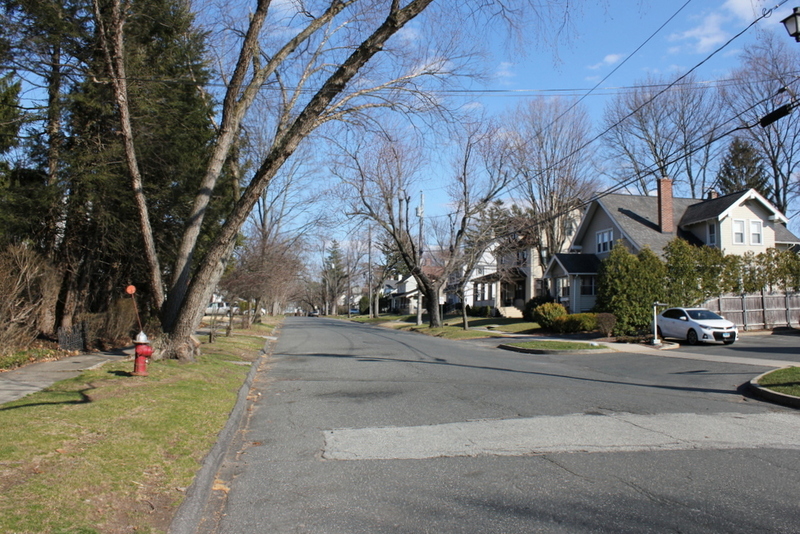 Part of the South Park Terrace development, most of the houses along Converse Street had just been built when the first photo was taken, and more would be added in this area as Longmeadow became a major suburb of Springfield. 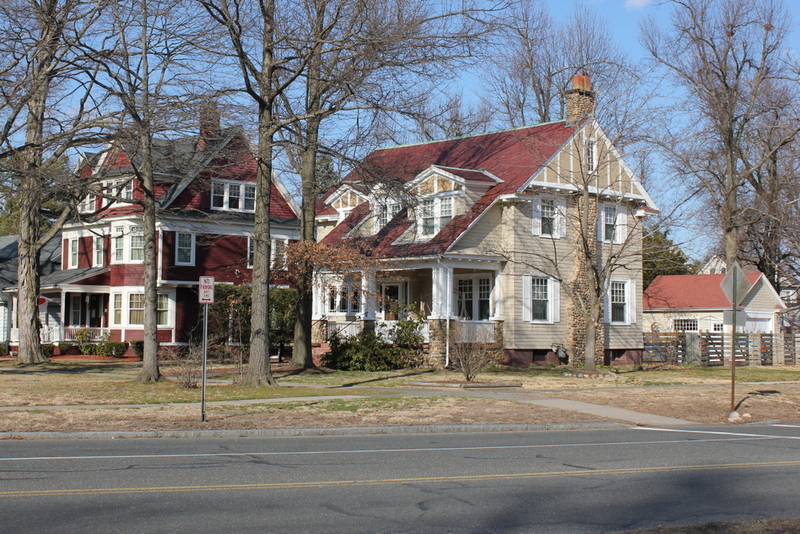 In the century since the first photo was taken, Converse Street has been paved, and the end was angled a bit to share a traffic light with Englewood Road on the other side of Longmeadow Street, but otherwise not much has changed in this scene, and most of the historic early 20th century homes here are still standing. 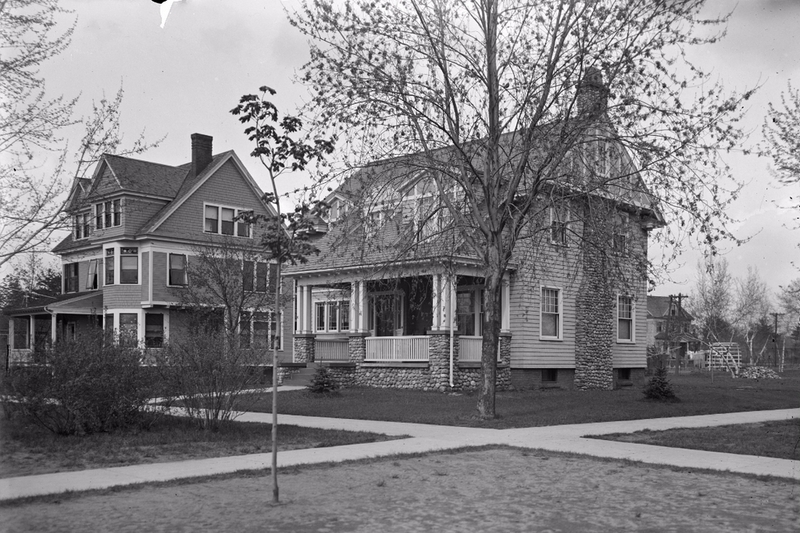 The Bernard Graves House at the corner of Longmeadow and Converse Streets, on November 22, 1913. Image courtesy of the Longmeadow Historical Society, Emerson Collection. This view provides an interesting side-by-side comparison of two different architectural styles from around the turn of the century. Although built only a few years apart, these two houses represent a shift in style that was happening during this time. The house on the left was built around 1900, and it is an example of Queen Anne architecture, which was popular in the last few decades of the Victorian era. This particular house is actually a fairly subdued version of it; a typical Queen Anne house is usually highly decorative, with plenty of ornamentation and a complex combination of design features. A good example of this can be seen in this Springfield mansion from a previous post. This Longmeadow house was built towards the end of the style’s popularity, but it still has some of the common features, especially with its bay windows, wraparound porch, and asymmetrical design. The house on the right, on the other hand, represents the Craftsman style of architecture that was gaining popularity just as Queen Anne was falling out of fashion. It was largely a response to the perceived excess of the Victorian era and, by extension, its often gaudy architecture. Rather than decorating houses with excessive amounts of ornamentation, the idea behind the Craftsman style was to simplify, and emphasize quality of workmanship. The house here, which was originally the home of insurance agent Bernard E. Graves and his wife Mary, was built around 1906, near the beginning of this style’s popularity. Over a century later, both it and the Queen Anne house remain well-preserved examples of their respective architectural styles, and aside from the shutters on the house and shed in the backyard, it is hard to notice any differences in these two photographs. 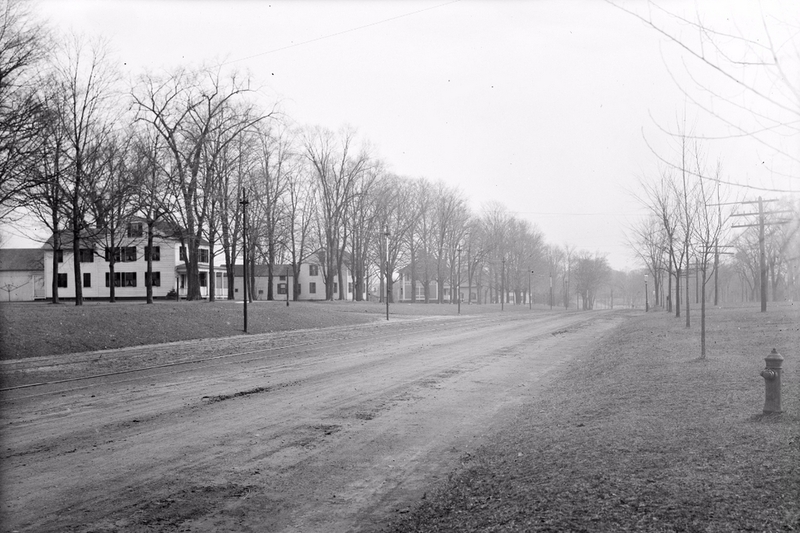 Looking south on Longmeadow Street from the corner of Bliss Road, on March 27, 1908. Image courtesy of the Longmeadow Historical Society, Emerson Collection. 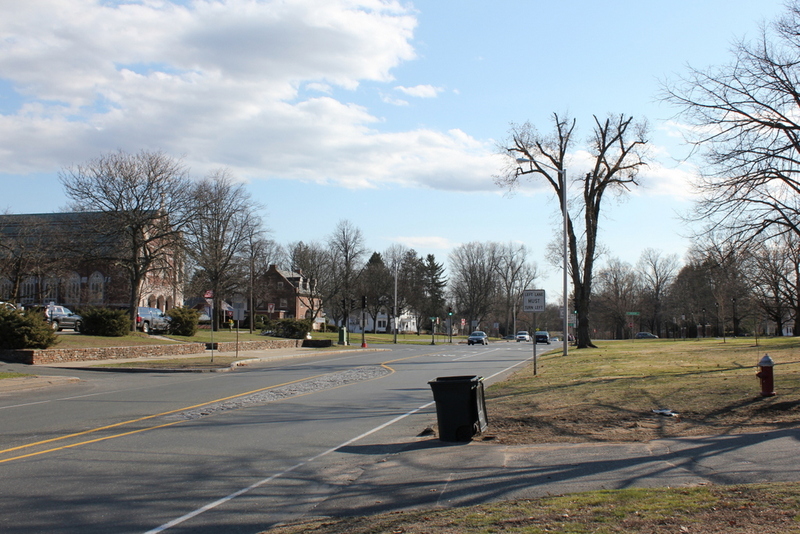 Most of the views along Longmeadow Street have not changed much over the past century, but here there are some noticeable differences. To the left is St. Mary’s Church, which was built in the early 1930s along with the house next to it. They replaced the two houses on the left side of the first photo, but the third house in the distance is still standing. 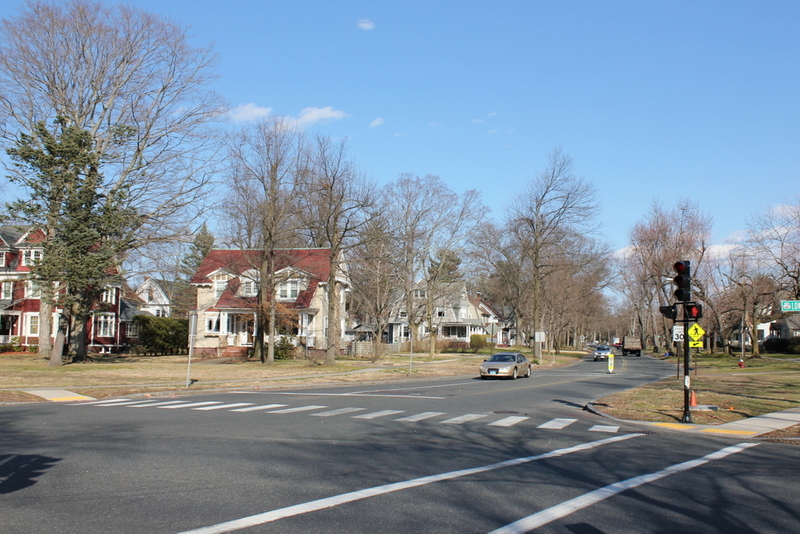 It is now part of Bay Path University, whose main campus is located on the right side of the street, just out of view in this scene. Another change from the first photo is the trolley tracks, which were built in the 1890s. 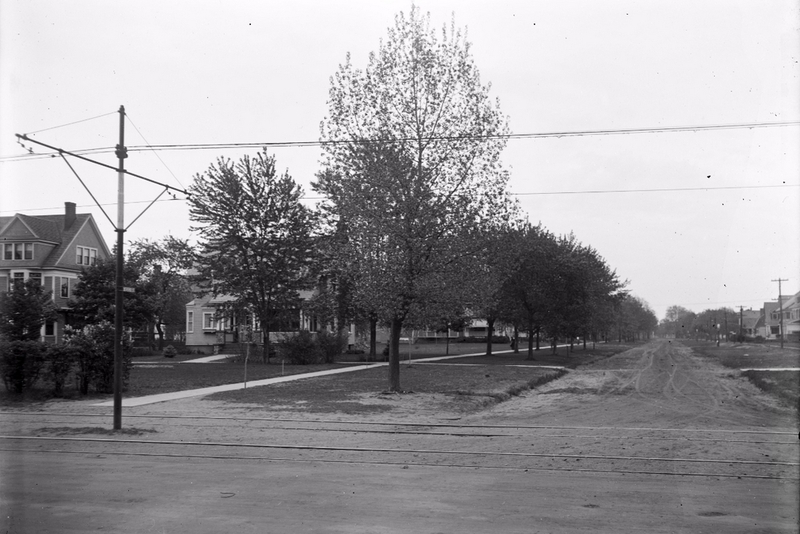 Part of the Springfield Street Railway, they helped to spur development in Longmeadow by making it easy for people to live here and commute to Springfield. This led to new housing developments such as the scenes in earlier posts on Bliss Road and Belleclaire Avenue, both of which are just around the corner from here. 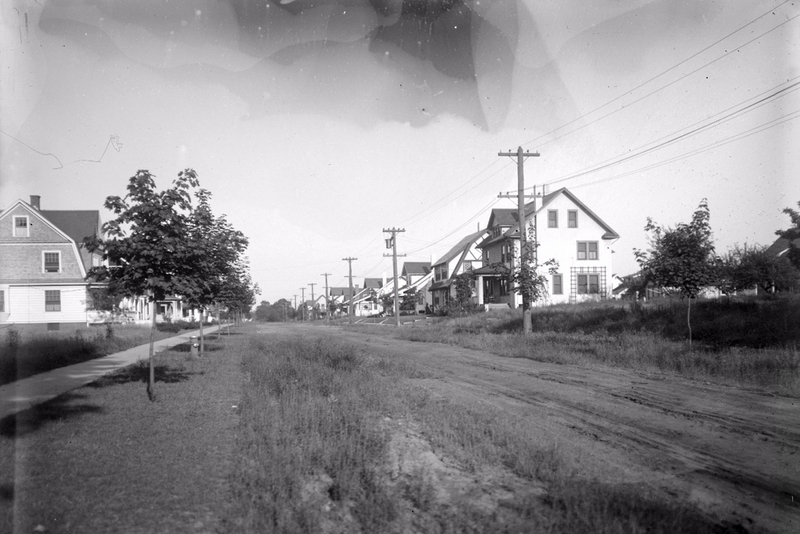 Looking east on Belleclaire Avenue from the corner of Lognmeadow Street, on August 23, 1918. Image courtesy of the Longmeadow Historical Society, Emerson Collection. This street is a block north of Bliss Road, which is seen in the previous post. 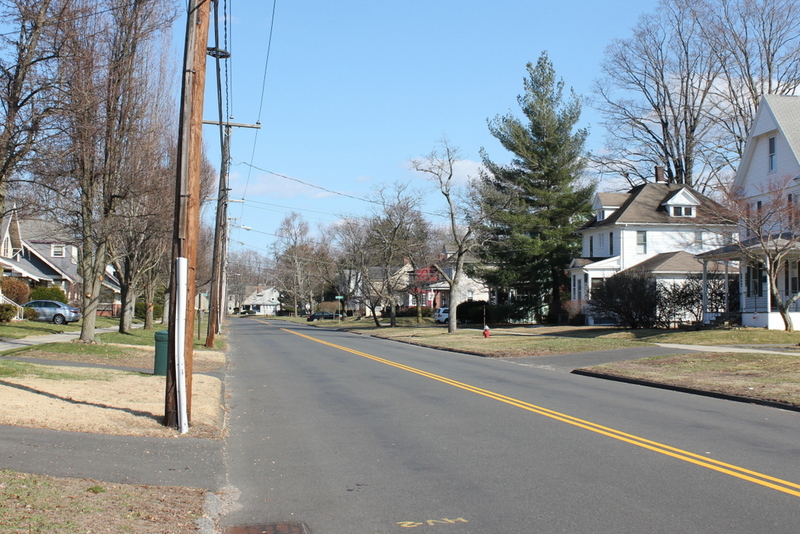 Like Bliss Road, Belleclaire Avenue was part of the rapid suburban development that was occurring in Longmeadow in the first two decades of the 20th century. Most of the homes here were built around 1915, with a variety of designs that reflect the popular Craftsman-style architecture of the era. Since the first photo was taken, little has changed here. A few houses, like the one on the far right, were added soon after, and the trees have grown up, but otherwise the street looks much the same as it did almost a century ago. 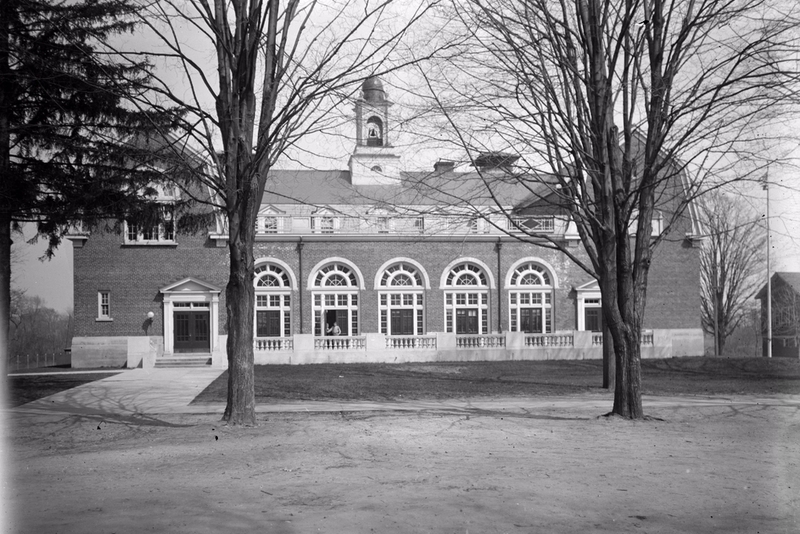 The Junior High School, seen from the Town Green in Longmeadow on April 27, 1923. Image courtesy of the Longmeadow Historical Society, Emerson Collection. 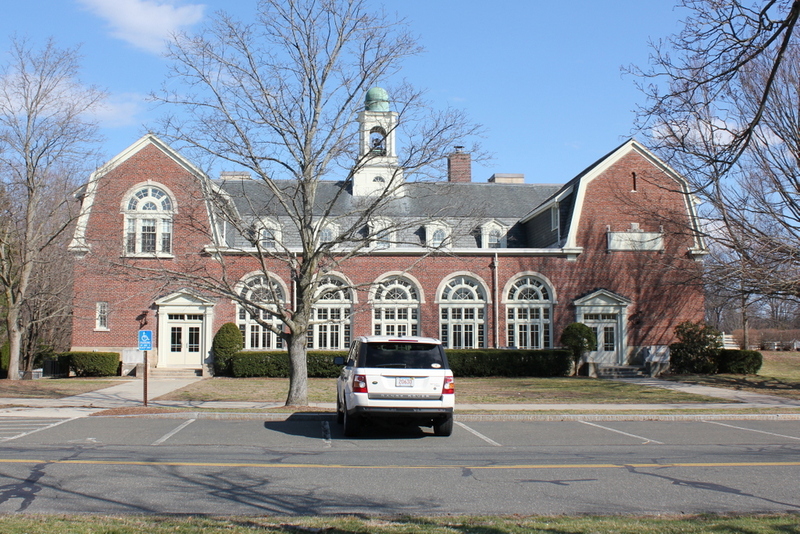 This school was built in 1921 as the Longmeadow Junior High School, and seven years later another school building was built just to the right of here. The two buildings later became Center Elementary School, and today from this angle they look the same on the outside as they did in the 1920s, but everything on the interior is new. Both buildings were completely gutted in the mid-1990s, leaving only the exterior walls still standing, and an entirely new structure was built inside. They were also connected via a new library, which was built in the back of the school, below the grade of the road.. By preserving the exteriors, and by making the modern addition invisible from here, it helps to maintain the character of the Town Green area, which is a historic district on the National Register of Historic Places.